Super Hero Boy: An Easter Dinosaur?! You know I never really thought about it before but Barney and his friends actually make for a pretty cool Easter crowd, especially as brightly colored as they are, heh, they kind of look like Easter eggs in their own right! We are headed to Connor's first big boy Easter egg hunt this weekend and I wanted to get him in the mood so we sat down and watched Barney's Egg-cellent Adventures! Three Easter appropriate episodes of Barney are included : Rabbits, Duck and Fish and Mother Goose. As well there are two Easter themed dvd games The Gumdrop Matching Game and Barney's Easter Egg Hunt. The Easter egg hunt game was the perfect little pre-easter warm up to all the egg hunting we will be doing here shortly! I can't wait can you tell? Connor was so excited about the rabbit themed episode. We have been talking about the Easter bunny all month so anything involving rabbits gets him going. 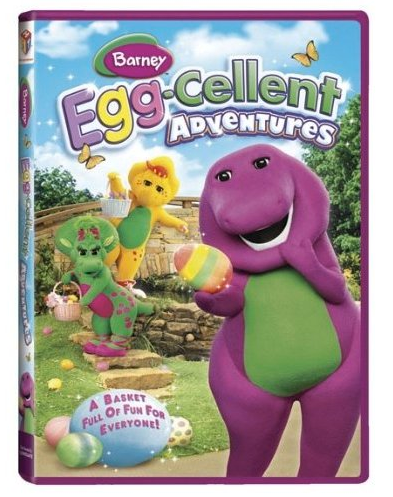 Barney's Egg-Cellent Adventures would make for a perfect warm up to your Easter festivities or a great video to watch all spring long as though the dvd is labeled for Easter and the mini games are Easter themed, the episodes included are perfect for anytime in the spring. Who can resist cute bunnies any time of the year anyways? You can pick up your own copy of Barney's Egg-Cellent adventures right now on Amazon !